^LOL. Good ol' Blogett Bird, the 'inside source' who can never reveal anything. Gotta love it. Still, she may have revealed enough in her Tweet to makes it sound like good news may be on the way. Was I the only one who was moved by the thoughtfulness of this tweet? Sharing. That's what Valentine's Day is about people. @dromMomma nice! Remember to ask them about Haley and how her 2013 is holdin up! @HaleysGrrrowl i did! But I cant give it up... I been sworn....to keep my mouth shut. But every one will be pleased so relax all is well. (02-14-2013, 11:24 PM)Babbs234 Wrote: Sounds like good things comin up for Haley!! I was next to dromMomma when Patti relayed that info to us. Our lips are sewn shut and our fingers can only type vague excitement. 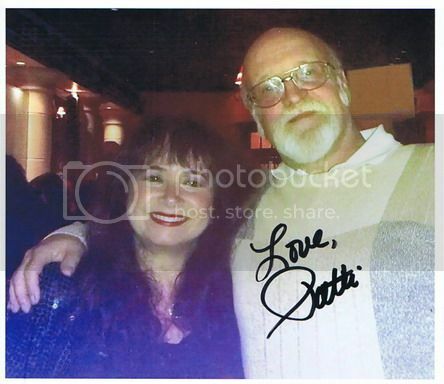 (02-14-2013, 11:16 PM)Babbs234 Wrote: ^^^ Himm, that's a great picture of you and Patti! I was just gonna post it and Tusk beat me to it. I just found this after I posted an improved version of that photo in the Harry's Band's thread. (02-15-2013, 08:30 AM)Himm2 Wrote: I was next to dromMomma when Patti relayed that info to us. Our lips are sewn shut and our fingers can only type vague excitement. Back in the studio, recording a cover that many of you have requested..
or maybe "Like a Star?" Funny thing is Patti asked me to pick her and Babbs up to go to Casey Abrams gig down in Joliet on Feb. 26th. Now I'm DYING to know what cover Haley is recording! Holy Moly!! I'd love to hear Haley do a studio version of Like A Star. That song fits her voice so well. One thing about Haley, and what makes her so different from most young singers, is that she has the kind of voice that makes you want to hear her sing different material. Plus, she has such a magical sense of musicality that she makes whatever she sings special.